While a pipe is quite calming, it requires a little more upkeep than some are willing to put into their smoking experience. 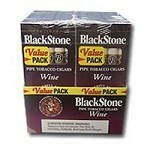 For those smokers, BlackStone Tipped Cigarillos are the answer! These small flavor-bundles are made exclusively with pipe tobacco and offer the same aromatic relaxation that pipe smokers have known for years. Still can’t decide between pipes and cigars? Then enjoy the best of both worlds with Blackstone.